In the very earliest days of the Hawkers Beer project, co-founder Mazen Hajjar told us of his plans to introduce a second label dedicated to approachable, session-minded, lower ABV beers that they'd sell in mini-cases. The hope was that, in both price and character, such beers would entice and then not scare off the masses of Australian beer drinkers that craft breweries need to win over to truly thrive. The success of the core Hawkers range – and demand from others to have their beers brewed at the Reservoir brewery – meant the fruition of the plan has taken a little longer than intended. But, as the brewery approaches its second birthday, Rover has arrived. And it's pretty much as outlined in those conversations: session strength beers to be sold in 12-packs (of old school stubbies) at little more than $30 a pop. 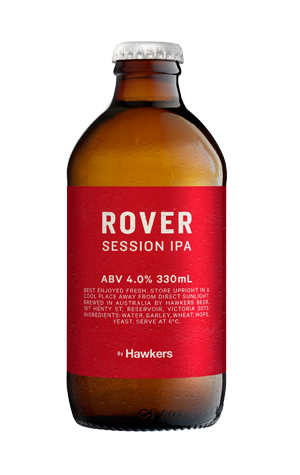 The first two Rover beers are this Session IPA and a Session Ale – which is listed here. The IPA comes with the lower ABV, but presents as a bigger beer. Darker in hue, it's based around peach/nectarine hop aromas and flavours (with perhaps a hint of citrus in there too), supported by a touch of malt sweetness and a bitterness that's broad without being overpowering.